We’d like to express our sincere thank you for your generous donation for the past couple of months for our Blitzen. We are happy to announce that we have reached our goal through our ChipIn donation and others. Blitzen have had successful surgery on March 22nd, 2011 and now resting comfortably at his wonderful foster family’s house. We are so happy that we could provide him with the proper care so he can enjoy his life without discomfort. Blitzen is an exceptional little boy who’s touched our hearts. We are truly blessed with wonderful supporters like you so we can save more lives like his. Please continue to support us because without you, we cannot continue our mission. 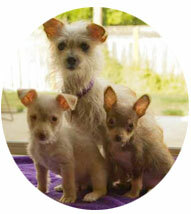 Blitzen is a 3 months old Terrier/Chihuahua Mix puppy who was rescued from an overcrowded shelter with his mom Snowflake and his brother Rudolf. When nobody could rescue them, we took them in to save them from euthanasia. Blitzen suffers from dry eye when he was born and since his eyes were not cared for properly with vet care prior to being abandoned at the shelter, his right eye is blind. And now it is becoming more irritated, and the eye specialist has told us that it needs to be removed otherwise it will get infected. The cost of eye surgery is $2000. Blitzen will need to have his surgery within the month. We take in a lot of special need cases which incur high medical expenses, so our funds are especially low right now. We really need your help and support! Having one eye will not slow down Blitzen. He will enjoy his life as a happy furry kid just like other dogs that have the same condition. “Saving just one pet won’t change the world. . . but, surely, the world will change for that one special dog or cat “. …and he is that special dog. Please help us give this wonderful boy the quality years he deserves… You can click the “Chip In” button below and securely donate online. We really appreciate your compassion. *Chip In fundraising has been closed. Thank you for your contribution!! Please spread this to your friends and family and help us help Blitzen who’s already had rough life for his first 3 months. We would like to thank everybody who generously donated for Blitzen! As of now we have raised $825! Please help us promote this fundraising by sharing on your web site, blog, Facebook, Twitter and many other social network sites. You can add the ChipIn donation screen by clicking the “Copy” link on the widget. Updated picture of Blitzen, his brother Rudolph and their mom Snowflake! We visited Eye Specialist with Blitzen again and it is decided to move his surgery to April. Each visit will cost us about $150-$237 (so far we’ve had 4 visits) . More visits will come before his surgery and following surgery. For that reason we had to increase the Chip In fundraising amount to $3,000 from previous $2,000. We really really appreciate your continued support on this fundraiser! No matter the price, we know it is worth it. 2) Create your own campaign on your Website, Twitter, Facebook, My Space, Blog etc. You can copy and paste following code to use it on your home page or blog to use our Chip In. Here’s how you can display our Chip In Widget to your web site, blog etc. Flyer for this fundraiser is available in PDF. Please download and post wherever you can and help us spread this fundraiser for Blitzen! Rescue Chocolates (for people only) Fundraiser!